The '14 Q50 goes on sale in August. Infiniti's future product strategy already was a story of big changes. But in recent weeks, the luxury marque has signaled that it will shuffle that plan. Johan de Nysschen, Infiniti's global boss now a year on the job, says he wants the brand to compete in 90 percent of premium vehicle segments, up from 60 percent today. He has put on hold the LE electric sedan Infiniti has planned to spin off from the Nissan Leaf platform. Infiniti vehicles get new names beginning this year. Instead, Infiniti will shift resources to create a luxury sedan and coupe at the high end of its lineup and a small car at the low end. Some of the new products could come as late as 2018. Meanwhile, Infiniti showrooms will appear to be stocked with new products for the 2014 model year as the company switches to an alphanumeric naming system. Q50: The redesign of the G37 sedan hits the market in August as a 2014 model. Now more aerodynamic and low-slung, the sedan gets a roomier and more ergonomic interior. It retains the G37's base 3.7-liter V-6 engine that produces 328 hp. Next year, the Q50 will add a hybrid that combines a 3.5-liter V-6 with a 50-kilowatt electric motor. The car will contain two edgy new technologies: Direct Adaptive Steering, a steer-by-wire system that lets drivers select the desired degree of steering rigidity, and Active Lane Control, which provides an element of automatic correction to lane drift. Infiniti plans to offer the Q50 with a diesel engine for some markets -- particularly Europe. The company has not decided whether the diesel will sell in the United States. Q60: The G coupe will be renamed the Q60, but will be carried over from 2013. 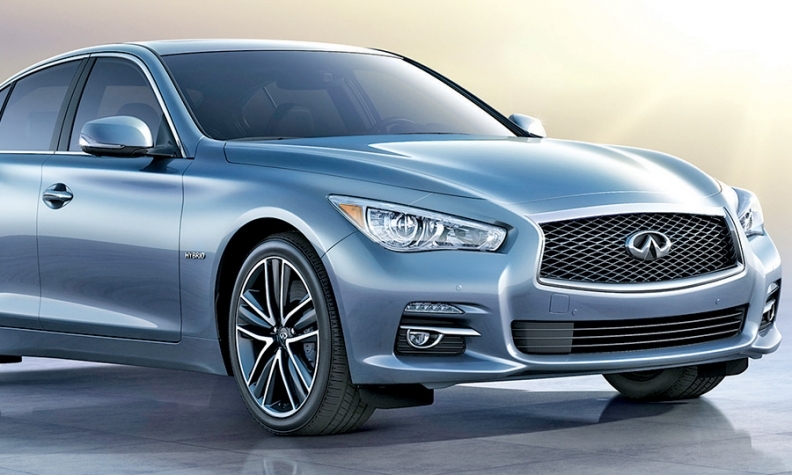 For 2015, the coupe will be redesigned to follow the new Q50. Q70: Formerly the M56 and M37 sedans, the Q70 will be unchanged for the 2014 model year when it appears in December. A Q70 Hybrid will debut as a 2014 model early next year. The sedan will be freshened for 2015. Infiniti will introduce the QX60 Hybrid crossover this fall. QX60: The three-row JX crossover becomes the QX60 starting in 2014, with minor electronics component enhancements. 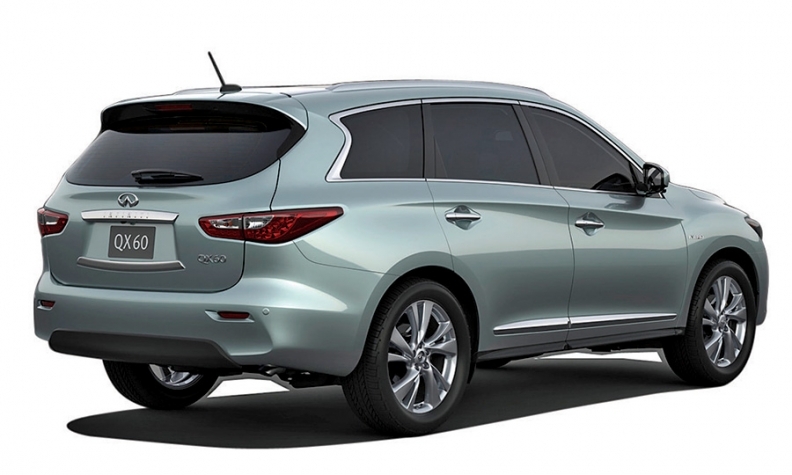 This fall, Infiniti will introduce the QX60 Hybrid as a 2014 model. The hybrid powertrain will be a supercharged 2.5-liter four-cylinder engine combined with a 15-kilowatt electric motor. The system will deliver 250 net hp, compared with 265 hp from the nonhybrid QX60's 3.5-liter V-6. Q30: Infiniti is developing a compact car with input from parent Nissan Motor Co.'s technology partner, Mercedes-Benz. The debut is planned for the 2015 model year with production coming from England. Like other cars in the entry-luxury class, the vehicle will feature a high-output four-cylinder engine. LE: In early 2012, Infiniti showed the concept version of its electric luxury LE sedan, based on the Nissan Leaf platform. Infiniti product developers had resolved internal debates over the EV's styling and the LE was to reach showrooms in 2014. But de Nysschen and the company have delayed the program until as late as 2017, saying that the rollout must wait for an improved generation of lithium ion batteries that is in the pipeline. High-end sedan and coupe: For years, Infiniti has resisted re-creating a high-end flagship to fill the void left by the cancellation of its Q45 in 2006. But de Nysschen is taking Infiniti into a segment above the current M56, putting the brand into the BMW 7-series range. A premium sedan and coupe are being planned for later in the decade, possibly the 2018 model year. FCV: A three-product fuel-cell vehicle platform is being jointly developed by Daimler, Ford Motor Co. and Nissan Motor. The resulting vehicles will appear starting in 2017. The project was announced in January, but few details were released. Given the expense of the new technology, the advanced-powertrain car is more likely to be an Infiniti than a Nissan. QX50: Formerly the EX35, Infiniti's low-end crossover is scheduled for a redesign in 2016. QX70: The mid-sized crossover formerly marketed as the FX is scheduled for redesign in 2016. QX80: The former QX56 is mostly carried over for 2014.